Michael van Gerwen won his fourth straight major title by beating two-time world champion Adrian Lewis in the Players Championship Finals. The 26-year-old Dutchman added the crown to his European Championship, Grand Slam of Darts and World Series of Darts titles won earlier this month. Van Gerwen was rarely troubled as he raced into a 10-5 lead before sealing an 11-6 victory with double six. "I'm really glad to have this title back," Van Gerwen said. "Adrian's a fantastic player but I was the better player in this game and I just want to keep this form going now because I'm playing really well," the world number one continued, after collecting the £65,000 winner's cheque in Minehead. "It's amazing. I've been on an incredible run, not just in this tournament but also in the tournaments before. They've been perfect for me." Van Gerwen has now won 18 PDC events during 2015, including The Masters, UK Open and World Matchplay. 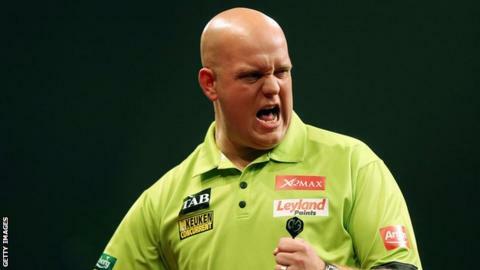 "It gives me so much confidence, but I need to relax and prepare for the World Championship," Van Gerwen added. "I'll be fresh and fit and ready to win another really big major." The 2016 PDC World Darts Championships starts on 17 December at the Alexandra Palace in London.